The cold snap has well and truly set in and we even saw some snow this weekend, for half an hour or so. Temperatures are plunging into the minus which calls for some layers and of course some winter boots. That said, for a day out yesterday, I hunted out my "cosywear" - essentials for a crisp winter's day - the only thing i'm missing are my gloves!! Are you like me and without fail, come Winter, can never find your gloves? I swear I lose them every Christmas!! Online Avenue is a UK based online footwear store (ships worldwide) that offers womens, mens and kids shoe ranges at affordable prices. Next on my shopping list are these boots - how gorgeous a colour!! What a great casual outfit, with a pop of colour! In love with those wedge boots! I love that beanie! Especially the olive color with the black and white sweater. How cute!! 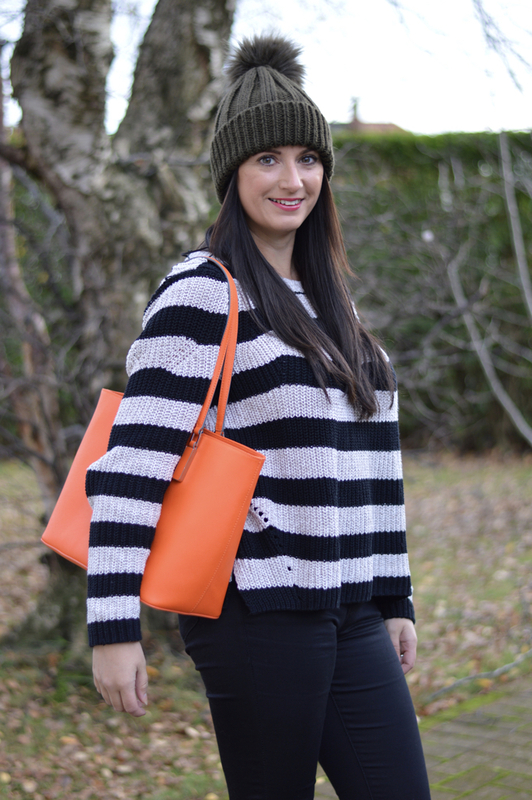 Love this look with the orange tote. I love the color of that bag. Thanks for hosting. Happy Thanksgiving!